Please welcome Tamar Sloan as our guest today. Tamar really struggled writing this bio because she hasn’t decided whether she’s primarily a psychologist who loves writing, or a writer with a lifelong fascination for psychology. Somehow she got lucky enough to do both. Tamar is the author of the PsychWriter blog—a fun, informative hub of information on character development, the science of story and how to engage readers. She is also a passionate writer of young adult stories of finding love and life beyond your comfort zone: A Moment for Tara and A Prophesy Awakened. I have two passions in this world—capturing life in words, and making a difference to others. Becoming a psychologist and a writer has allowed me to do both. Find out more about Tamar’s books here. Connect with her on Facebook and on Twitter. Personally, I don’t leave a review under four stars. I don’t want to inflict the pain of rejection and self-doubt on others when art is so subjective. And although constructive feedback is invaluable in growing as a writer, I don’t believe it has to be done publicly. On the other hand, I also understand that low-scoring reviews are valuable for other readers. That’s the whole point of a review—so others can learn from those who have been here before. We do it with cars and vacuum cleaners and hairdressers. So I respect those who leave honest reviews, whether they be five stars or the heart-ripping single stars. But a lone star staring at you from your screen, harsh words marching beside them, can be crushing. I think it’s important that writers appreciate why someone would take the time to record this, publicly, and irreversibly. You forgot who you were writing for. Maybe This Time is smart and quirky, brimming with the trademark Crusie repartee. 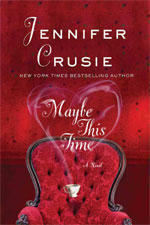 Here, with a Take 5 to whet your appetites, is Jennifer Crusie. Q: Jenny, what’s the premise of your new book, Maybe This Time? Andie Miller is trying to settle down, something she’s never been any good at, so before she gets married to an impatient fiance, she goes to sever her ties with her ex-husband, North. He asks her for one last favor: he has inherited guardianship of two children, and he needs someone to go to the isolated house where they’re living, evaluate their needs, and bring them to the city. Should take about a month. But when Andie gets there she finds that the children are hellions, the housekeeper is creepy, the house may be haunted, and she still has feelings for her North. Trouble ensues. Andie and North both have intimacy issues and communication problems that they were never going to solve on their own. But when two children enter the mix (what Henry James called “another turn of the screw”), they have to take the risk and connect, both to the kids and then to each other if they’re going to save the kids. And the fact that the kids don’t want them means they have to go way outside their comfort zones. Add to that a cast of supporting characters who are, each in his or her own way, trying for second chances, and you have a lot of desperate people in one big house, which puts Andie and North under even more pressure.